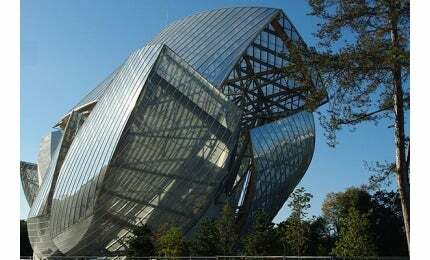 Located in the Bois de Boulogne, Paris, Louis Vuitton Foundation is an art and cultural centre designed by Frank Gehry. Image courtesy of Olevy. The foundation was commissioned by French billionaire Bernard Arnault. Image courtesy of Olevy. The 46m high glass and concrete structure was opened to public in October 2014. Image courtesy of dalbera. The building consists of white concrete blocks wrapped by an outer shell of 12 glass facades. Image courtesy of Valueyou. The Louis Vuitton Foundation is an art museum and cultural centre in the Bois de Boulogne overlooking the Jardin d’Acclimatation in Paris, France. The building was designed by Los Angeles-based architect Frank Gehry and was opened to public in October 2014 after six years of construction. The $143m museum building was commissioned by France’s wealthiest man Bernard Arnault, who is the chairman and CEO of the foundation’s parent company, luxury goods conglomerate Moët Hennessey Louis Vuitton (LVMH). The plan for the Louis Vuitton foundation building was conceived when Bernard Arnault met Frank Gehry in 2001. The project was officially announced in October 2006 and construction began in March 2008. The foundation is built on a 1ha plot of public land under a long-term lease that ends in 2062. "The design of the Louis Vuitton foundation was inspired by the 19th century glasshouses." The private museum houses a permanent collection of modern and contemporary art belonging to the Foundation and the personal collection of Bernard Arnault. It will also host temporary exhibitions of multidisciplinary installations and commissioned artworks from artists and private institutions. Approximately 600 people, including 350 architects, engineers and technicians and 250 construction site workers worked on the project. The museum is expected to attract 700,000 visitors a year. The design of the Louis Vuitton foundation was inspired by the 19th century glasshouses that previously dotted the Jardin d’Acclimatation, a landmark garden and children’s amusement park founded by Napoléon III in Paris in 1860. The 46m-high abstract structure resembles a cloud, a chrysalis or a sailing ship and is designed to blend into the natural surroundings of the park. Having a total surface area of 11,000m² with 3,850m² of museum space, the building is built on the edge of a water garden with a reflecting pool and a cascading waterfall. The building structure is made up of an assembly of white concrete blocks or ‘icebergs’ that are enveloped by 12 huge glass facades or ‘sails’. The curves and angles of the glass sails give the building a sense of transparency and movement, as well as to reflect the surrounding water and greenery. The glass also allows abundant natural light into the building. The building holds 11 exhibition galleries on four levels, a 350-seat modular auditorium and a restaurant. It also offers panoramic view of Paris, including that of the Eiffel Tower, Arc de Triomphe and La Défense from its four garden roof terraces. A green promenade with the plantation of 82 trees, including Cappadoce maple, walnut, red oak, Virginia tulip poplar and linden trees has been created around the structure. The complex structural design called for exact specifications and details of its different elements such as the curved sails and the iceberg’s surfaces. To facilitate this, a digital model of the structure was created using Digital Project software developed by Gehry Technologies for high-performance scalable 3D modelling. The 3D model allowed for close collaboration between the design and engineering teams and scope for improvement of the working method during the construction phase. Two pre-existing buildings including the Bowling de Paris were demolished excavating 120,000m³ of earth for the construction of the structure. The iceberg’s facade comprises of 19,000 white custom-cut Ductal panels covering 9,200m². The ultra high-performance fibre reinforced concrete (UHPFRC) ductal panels were manufactured using a vacuum moulding process called moulage sous vide (MSV) that uses a polystyrene master template and a mould to customise the panels to any desired curvature and geometry. Each panel weighs 35kg and is 1.5m long, 40cm high and 25mm thick. UK firm Foster + Partners unveiled a master plan for the expansion of the Norton Museum of Art in Florida in December 2013. Covering a surface area of 13,500m², the exterior glazing comprises 3,600 curved panels of Saint-Gobain glass made in special ovens in Italy. Each glass panel measures 1.5m x 3m and has a unique shape and curvature. The glass panels are attached to the base structure using a framework made of 2,000t of carbon steel, 2,000t of high-strength Duplex stainless-steel, 800m³ of wooden beams, 5km of rails and 10km of curving columns. Rainwater is utilised to clean the building’s facades and glass roofs, as well as to water the planted terraces and surrounding trees. Ground water is recycled and used in the building’s air conditioning system. Studios Architecture, the local executive architect for the project, assisted Frank Gehry and his agency Gehry Partners during the design and construction phases of the museum project. Vinci Construction was the general contractor for the construction of the building. Vinci subcontracted Eiffage Construction Métallique to assemble and build the exterior glass section. The framework for the panels was created and assembled at Eiffage Construction Métallique’s factory in Maizières-lès-Metz, France. A consortium of French architectural research consultancy RFR and TESS designed the glass roof and the iceberg. Bonna Sabla was commissioned to manufacture the UHPFRC panels for the façade of the internal iceberg section. Setec Bâtiment provided the mechanical, electrical, and plumbing (MEP) engineering services. Quadrature Ingenierie was engaged to provide project coordination and technical consulting services to architects and teams of contractors involved in the project. Alep was responsible for the landscaping and integration of the building into its surroundings.